Blank page tying your stomach in knots? 30 prayers to tackle that fear! Worthy to Write! The book that tackles those fears that hold you back from putting words on the page and submitting your work as a professional. Fears like—I can’t let anyone read my stories. Who cares about what I have to say? Who would read anything I wrote anyway? I’m not special or original enough. Do those fears fly through your mind like a plague of locusts, eating up your confidence each time you sit down to write? All those fears, and more, boil down to one problem—feeling unworthy. But you are worthy! God gave you a voice and all those ideas swirling in your head for a reason: to write them so that you can make a difference in the world. Let's tackle those fears together because you are Worthy to Write! 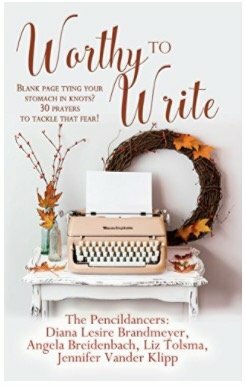 If you're a creative who wants to pour your heart out to God, to know that you are not alone, then buy now to start your thirty-day journey to feeling worthy. NOTE: This book contains full-color photographs. Those may not render well on black and white e-readers. However, all of the content remains perfectly accessible. Kindle On Preorder for a special price $1.99US, regular price Nov. 13, 2017 when it releases. Presented by the Pencildancers: Angela Breidenbach, Diana Lesire Brandmeyer, Liz Tolsma, and Jennifer Vander Klipp because we've also experienced those fears and worked through them to become best-selling, award-winning authors. We want that for you, too! First in the series, Worthy to Write is written just for the author on the journey to use God-given talent for His glory! I can’t let anyone read my stories. Who cares about what I have to say? Who would read anything I wrote anyway? I’m not special or original enough. Let’s tackle those fears together because you are Worthy to Write! If you’re a creative who wants to pour your heart out to God, to know that you are not alone, then buy now to start your thirty-day journey to feeling worthy. Special bonus section: Each Pencildancer has included a sample chapter of their own work so you can try new voices or a preview of favorite author’s next book.